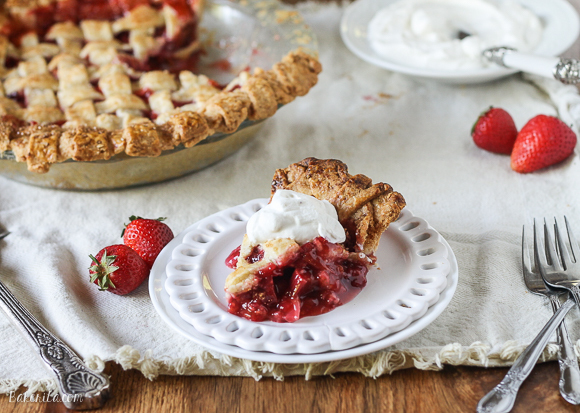 This Berry Rhubarb Pie features fresh strawberries and raspberries, which pair perfectly with the tart rhubarb to create a sweet and tart pie that’ll have everyone asking for seconds! Real time confession: I just snuck away to the kitchen right before writing this and snuck a bite out of the itty bitty piece that’s left of this pie, and smothered it in some of the vanilla whipped cream from my last post. Not to sound pushy, but seriously: if you’re a pie fan, this is one you don’t want to miss (says the girl whose mouth is full of pie). Before this particular berry rhubarb pie, I had never tried rhubarb. I had made a few strawberry rhubarb pies back in the day for a friend of my mom’s, but pie isn’t the sort of thing you can try before you give someone. I gave the strawberry rhubarb pies to her and crossed my fingers that they were alright. Her husband loved the pies, and requested them again for his birthday. I made the pie again, still having never tried rhubarb. That was four years ago. Now that I’ve finally tried rhubarb, as of four days ago, I totally understand what all the fuss is about. I love the sour, tart flavor of the rhubarb, and it’s gorgeous red color, and how well it pairs with the sweet strawberries and raspberries. It adds another layer of flavor that makes eating this pie a totally transcendent experience (don’t mind my pie-loving exaggerations). I was being a bit lazy and didn’t feel like fighting with a rolling pin, so I used Trader Joe’s frozen pie crust. It was surprisingly delicious! Be like me and use a premade crust (I definitely recommend the Trader Joe’s one) or make your own pie crust with your favorite recipe for maximum crust flakiness. The filling is simple to stir together and bake, and the lattice crust is easier to put together than it looks – trust me. If I can do it, you can do it. Pie crust is usually my enemy (except when I’m eating it). 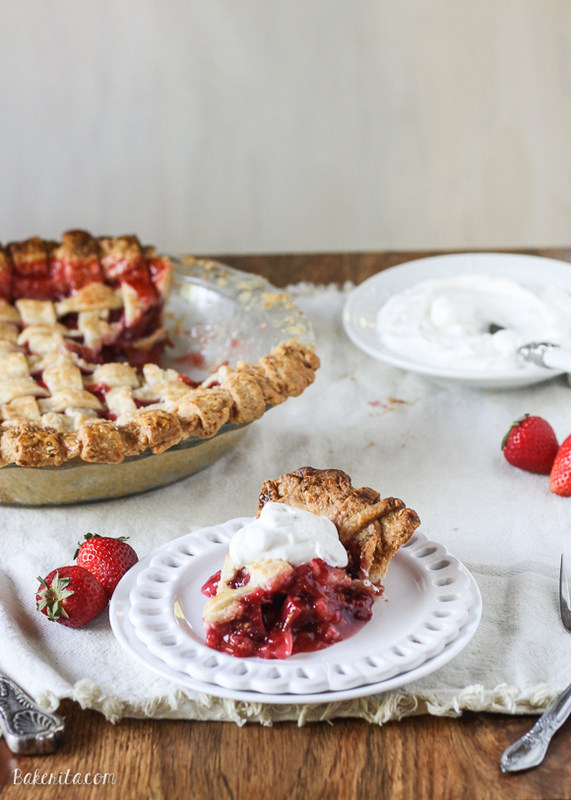 This berry rhubarb pie epitomizes everything that I want in a springtime dessert: the first batch of sweet berries, a little bit of tartness from the micro-seasonal rhubarb, and that flaky bite of pie crust with just enough heft to hold it all together. Top it with a little bit of whipped cream, or ice cream, and swoon. I’m going to get another bite. Enjoy! In a pie dish, lay out the bottom pie crust. Place in the freezer while you prepare the filling. Mix together the rhubarb, strawberries, raspberries, sugar, tapioca starch, flour, zest and juice of lemon, cinnamon, nutmeg, salt, and vanilla. Mix well in a large bowl and pour out into chilled crust. Brush edges of pie crust with egg white wash. Roll out the other piece of dough into an 12-inch circle. Using a sharp knife or pizza cutter, cut the crust dough into even strips roughly 3/4-inch wide. Lay half of the strips horizontally over the prepared pie, spaced evenly. Use the longest strips in the center of the pie and the shorter strips towards the edges. Fold every other strip back on itself, and place a strip of dough down vertically so it lays over the unfolded strips. Lay the folded dough back flat over the vertical strip, and fold the strips under the vertical strip back over the top. Lay down another strip, and repeat swapping the folded and unfolded horizontal strips and adding one new vertical strip each time. Repeat until the pie crust is completely latticed. ** Crimp the edges of the pie. Brush with egg white wash and garnish with large granule sugar. Collar with foil and bake at 425°F for 15 minutes. Decrease temperature to 375°F and bake for an additional 45 to 50 minutes, or until the filling starts bubbling. Let cool before serving. Yes please!! This looks delicious! It’s so good! I was reading a post about people’s favorite Trader Joe’s products (the things I do in my spare time…) and the pie crust was mentioned so I picked it up to try last time I was there. It really is so good! Thanks for your sweet words, Natalie! OK, you’ve convinced me to experiment with rhubarb, this looks amazing! I love the lattice crust, too! This sounds like such a perfect spring and summer pie, makes me want warm weather and picnics to enjoy a slice of this with! This pie is just drop dead gorgeous. I can smell the berries and rhubarb here! Rachel this pie is perfection, and I love rhubarb pies more than I can say. I love that you used mixed berries — delicious! Yummy! Thanks so much for sharing! I have to say, YUM! Your pictures alone have me drooling over here. This looks delicious. I had rhubarb at Knott’s a long time ago, but never in a pie. I’ll have to try this. Thank you for sharing! Yum! I recently made my first ever pie (apple) and am looking forward to trying another. Oooh this looks great! I love the lattice crust. Rachel, this pie looks straight up so delicious! 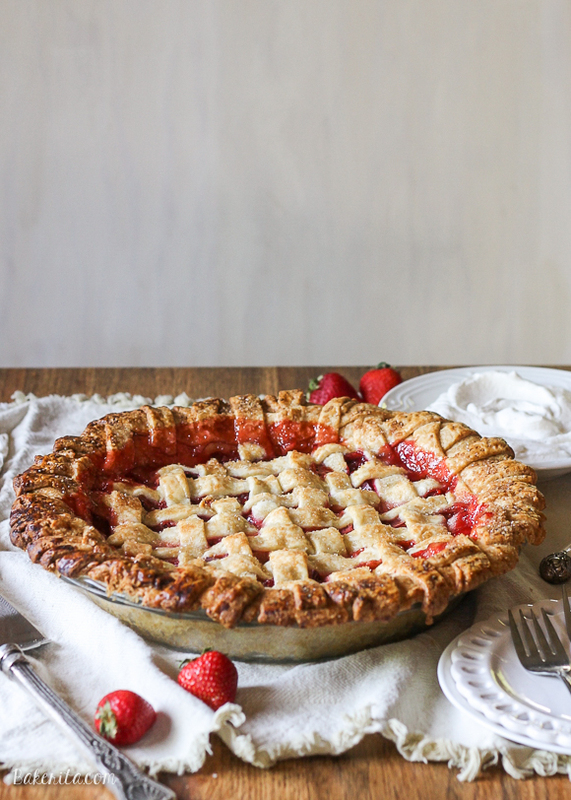 I love, love strawberry pie, but have never actually had it (or any berries) with rhubarb, which I totally need to fix because this pie look awesome! Just printed out the recipe :) I’ve always wanted to make a rhubarb pie and I love how you combine it with the berries! Can’t wait to try this out! Thanks so much Lisa, I hope you love it! Confession: I’ve never baked with rhubarb! 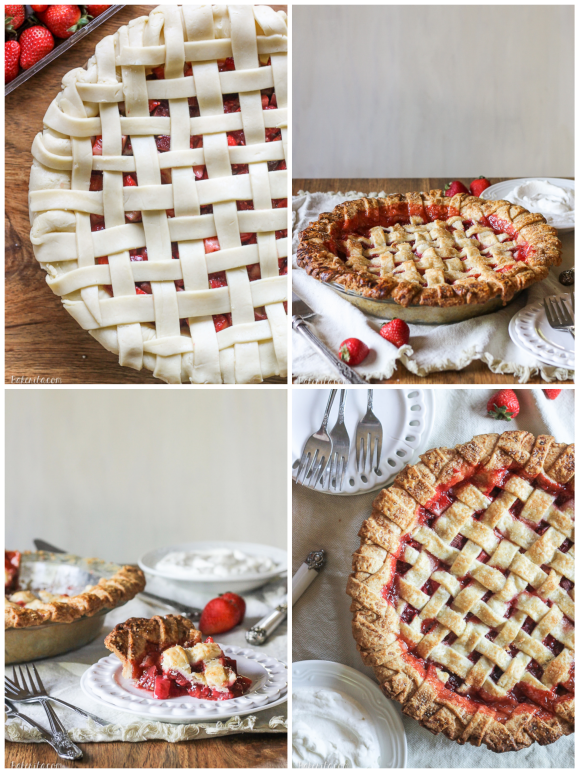 This pie looks too good to pass up though – and that lattice top is so purdy! 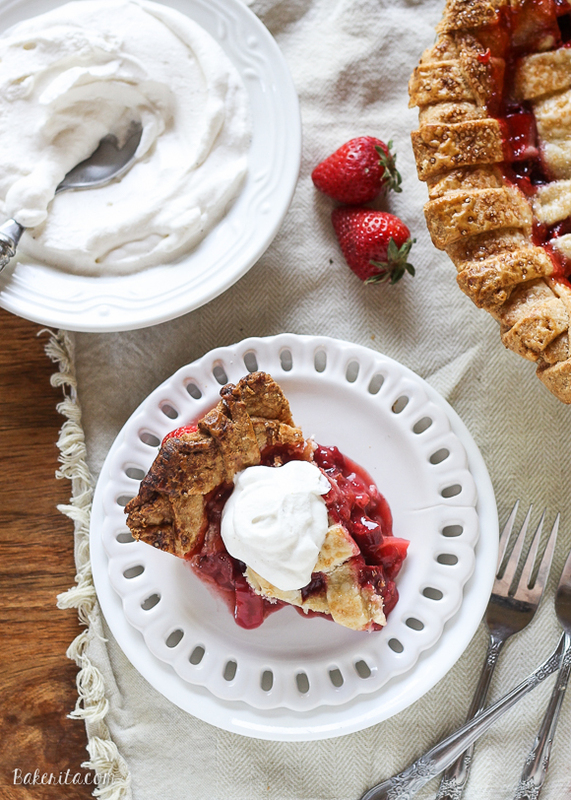 Rhubarb and berry pies could be my favorite type of pie! Looks beautiful! 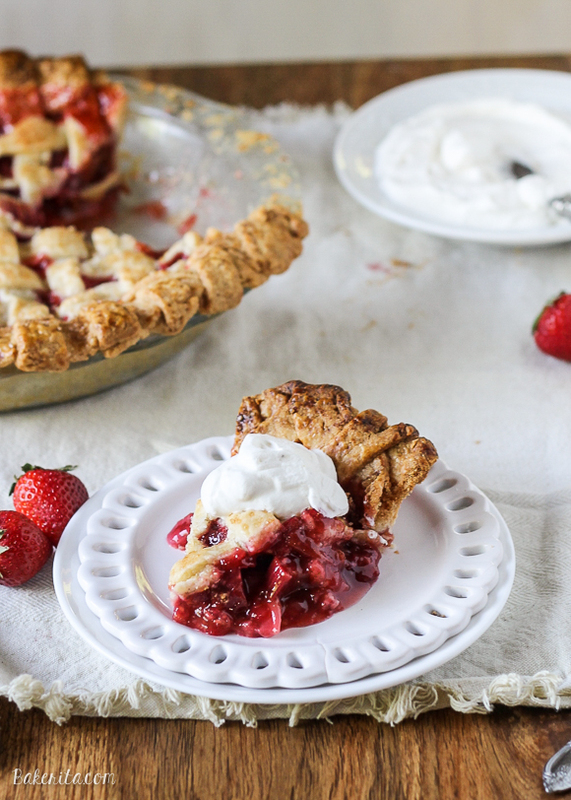 That oozy berry-rhubarb filling spilling out of that piece of pie is absolutely breathtaking (like I can’t breathe because I stuffed the whole piece in my mouth at once). I’m loving that lattice work too!!! !